ROCKVILLE — The temperature was below freezing, but that didn't keep die-hard Boston Bakery fanatics from braving the cold and coming out for a tasty pastry. The historic Boston Bakery, which has century-old roots in Vernon, once again opened its doors to the public after a several year hiatus. But this opening wasn't just any opening. The proceeds of this bakery are going to a non-profit organization to help the neighboring community. 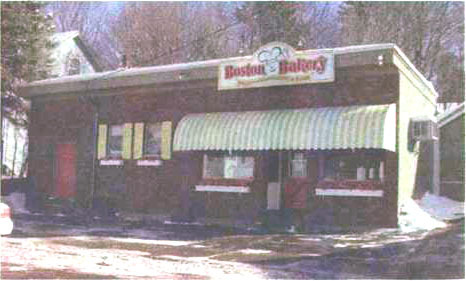 Boston Bakery was owned by the Walinski family in the 1940s - 1946, to be exact. When the family made the purchase, it was already a bakery. In fact, two families have run the bakery prior to the Walinskis. When Ludwik Walinski purchased the building, it was located on Union Street at the time, and was already named Boston Bakery because Union Street was considered a main roadway to Boston. The bakery moved to the current Ward Street location in 1958. The family sold the business in 1999, and sadly, just months after the purchase was complete, the bakery closed. Before and After. Some new shutters, a new sign and a bright, cheery awning helped spruce up the Boston Bakery on the outside, however, owner Bryan Flint said the inside of the business needed much more attention. Since the bakery had been closed for as long as it had, code updates needed to be made, and many updates - such as the new hood system - were expensive. 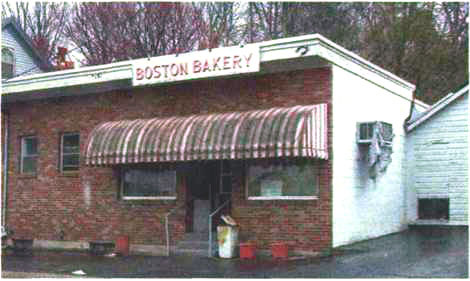 The photo above shows what the bakery looked like when the Flints bought it in 2003. On the bottom, the new Boston Bakery. Reminder photos. Enter Bryan and Kim Flint, who purchased the bank-foreclosed property in the spring of 2003. The two had high ambitions to open the bakery the summer of 2003, but found a lot of work needed to be done that they hadn't counted on when they first purchased the property. "Being closed for so long, we were not able to use the 'grandfather clause' to keep the bakery original," said Flint in December. "We needed to add many additional sinks, a new hood system, new flooring, new refrigerators, basically everything that pertained to food preparation, plus the decor was slightly modernized after the retail area was slightly enlarged." Hint said the biggest misconception he and his wife had in regards to the bakery was that it could be open soon after purchase. He said he would have been more realistic in regards to repairs. "We thought $20,000 and six weeks would have been enough to open, but boy were we off," Flint said. While the Flints still own the building, another group is actually leasing it. Bryan and Kim found themselves involved with the Nasons, who are part of the Lasting Hope Ministries. "I was approaching improving Rockville through an entirely secular, businessman's approach," said Flint, a former president of the Rockville Downtown Association. "After three years of efforts, I realized something simple, yet complex, was the problem in Rockville and in many other areas. The spiritual needs of our people weren't being addressed. The system in this great country of ours is set up to only address certain limited aspects. If we're ever going to make real headway with poverty and urban blight, we need to address and treat the cause, not just the symptoms. "Meeting the Nasons and getting more involved in the spiritual problems our society faces has made me come to understand that I was approaching the problem from the wrong direction," Hint continued. " Lasting Hope Ministry's plan is to be involved in the day to day life of many people who are seeking help. Once the bakery is turning a profit, the proceeds will fund the ministry's counseling center so that a great benefit is put back into the community without more expense being added to our shrinking social service budgets. All sides of the argument should be pleased to know that people are actually being helped, without an added cost to taxpayers' bills." Besides the bakers, who are paid staff, most of the bakery is run by volunteers. The profits from the bakery will go toward opening a new counseling center on Union Street. The ministry also hopes to open two residential homes for men and women looking for a second chance in life. While many members of LHM are associated with the Church of the Nazarene in Rockville, the ministry is not associated with any particular church, said the Rev. Rick Nason, CEO of Lasting Hope Ministries. 'Technically it's not associated with any church, but we want to be a support for the whole neighborhood [and its] churches," Nason said. The Rev. Sherry Nason, President of LHM, had a vision for the ministry back in 1991, and admits she almost gave up on her plan, which finally came to fruition in the summer of 2004. "I had the vision in 1991 to start a ministry to give hope to the hopeless," Nason said. "We're hoping the bakery will be a light to the community." Everyone who comes in here is so excited - literally jumping up and down," she added, now that the bakery is open again. The bakery has been open since Jan. 6, but the official opening was held Jan. 25. David Kuslansky. a Rockville resident, knew the Walinski family and thinks the re-opening is a fitting tribute to them. "Opening the bakery is a good testimony to the late Mr. and Mrs. Walinski - Pop and Mom, as I called them. They had a wonderful following." Kuslansky said he would like to see more private businesses in Rockville. Another resident, identified only as Gene from Vernon, admitted that he didn't always see the vision of reopening the bakery. "I think this is great, what they've done here. I have to be honest, I didn't think it was going to work because I had a business before and it's hard. This is working because God is making it [work]," Gene said. Another customer has been waiting for this day to come. "Good luck, it's about time," he said, on his way to the counter. Boston Bakery is open Tuesday through Saturday, 6 a.m. to 6 p.m., and is located on Ward Street.